Cattle grazing on lush, early spring grasses should be fed supplemental magnesium to aid in the prevention of grass tetany. Grass tetany is a deficiency of magnesium in the blood. It is most common among lactating cows grazing on early spring grasses. Grass tetany can lower weight gain, reduce milk production, and decrease weaning weights. 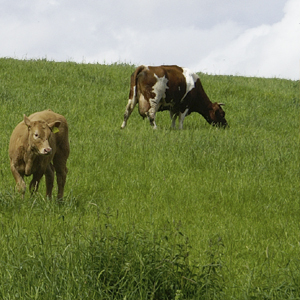 Most causes of grass tetany occur in the spring when grass is young and lush. Availability of magnesium is reduced in early grass due to the accumulation of ammonium, which interferes with magnesium absorption. Absorption of magnesium is further reduced when greater amounts of ammonia are released in the rumen following rapid ingestions of large quantities of lush green pasture. Common symptoms of grass tetany are solo grazing away from the herd, irritability, muscular twitching in the flank, wide-eyed staring, muscular incoordination, goose stepping, staggering,collapsing, head in the back position, thrashing, coma, and death. Cattle grazing on lush, early spring grasses should be fed supplemental magnesium. Feeding should start at least one month prior to tetany season.